One Sunday I was walking the halls of the building during sacrament meeting with an unruly two year-old. My daughter and I would study the paintings and I would have her point out people or animals. As we looked at the Sermon on the Mount I was reminded of the child and butterfly I have noticed before and always felt was so out of place. When I later searched online I came across an excellent post by Patrick Werick. 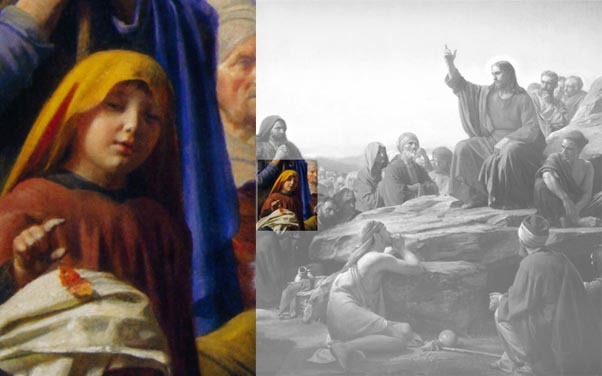 Patrick Werick does digital-image restoration and retouching for the website Restored Traditions. 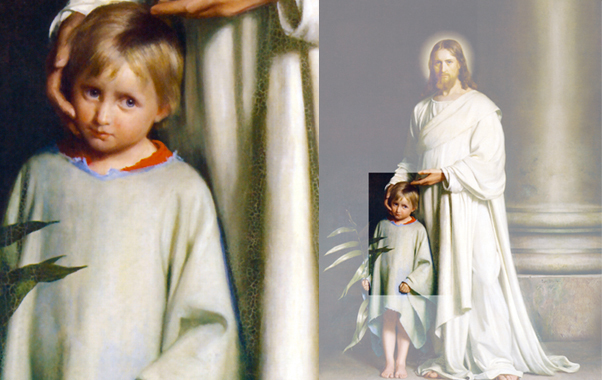 He posted in the past about Carl Bloch, that butterfly, and the curious children hiding in many of the paintings. 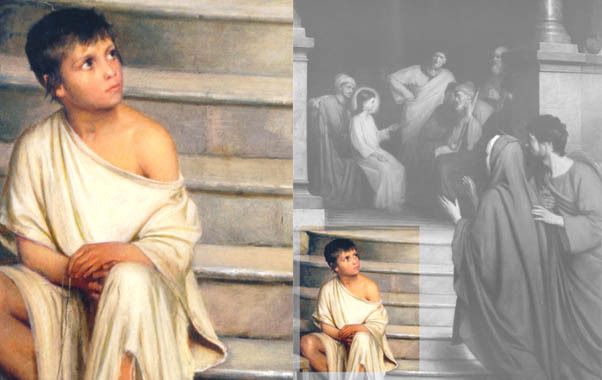 I wanted to republish his post here as Carl Bloch has become such an iconic artist in Mormondom (though Bloch was not Mormon). It’s fun to get to know the personality of the artist through the greatest legacy he left behind. No, Carl Bloch didn’t write a nifty blog—he spoke through his paintings. It’s fascinating to get to know a person solely through their art. So what have we learned about our new friend Carl? He loved sneaking random children into his paintings that express some of the greatest stories of Catholicism. It’s not something you notice right away, and it’s not something he did in every painting, but there are certainly enough of his artworks where children show up—usually appearing around 10-years old. What’s even more cool is that they’re usually the only ones looking right at the viewer’s eyes, shoes or shoulders. Carl Bloch had eight children whom he dearly loved. His friend, Hans Christian Andersen also saw the simplicity of a child in Bloch’s very personality and wrote about the same. 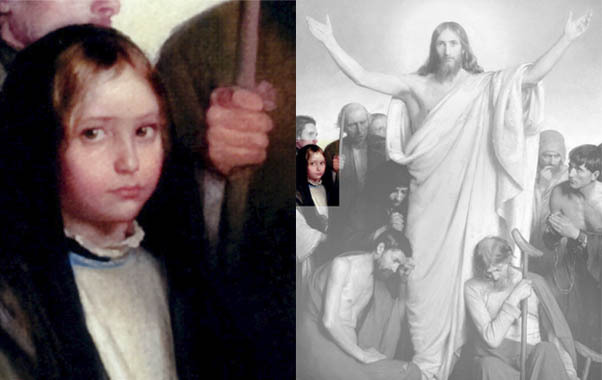 So let’s do a survey of some of these children that show up in his paintings. Perhaps the children were even modeled off his own children. In Christ the Consolator, Christ outsretches his arms to embrace mankind. Jesus is surrounded by suffering souls who are looking all over the place, and we see the only person looking at the camera (ahem, viewer) is a child with a doubtful look on his face. It almost looks like a hand-caught-in-the-cookie jar look. But that’s just our take. 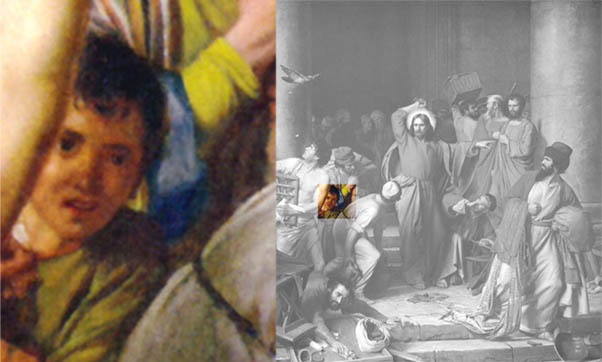 The painting of Christ Cleansing the Temple shows a crop of terrified merchants running for their lives as Jesus gives them the boot from the temple. The frightened looking child is lost in the chaos of the moment while all are fleeing. 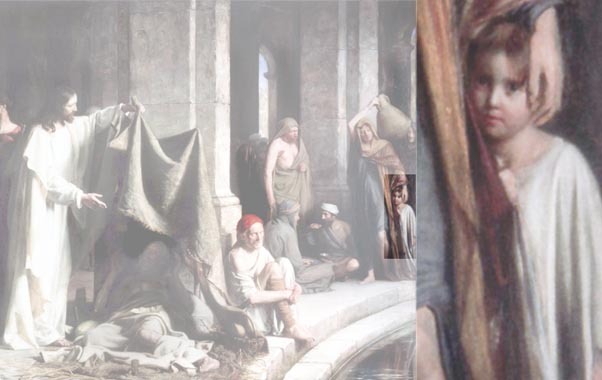 He appears to have a rag over his arm, so maybe he’s the sandal shiner boy, or perhaps a child of one of the merchants. Once again, while Christ Heals the Paralytic at the Bethesda Pool, a sole and obscure child is one of two looking at the viewer. This time, the child is with his mother (lady holding the water pot) and possibly his grandma (directly above child) who, interestingly enough, is also staring at the viewer as well. The old woman behind the child is smiling this time, while the child has a dazed look on his face that’s either oblivious to the miracle going on or still trying to figure out what’s happening on their daily water run. 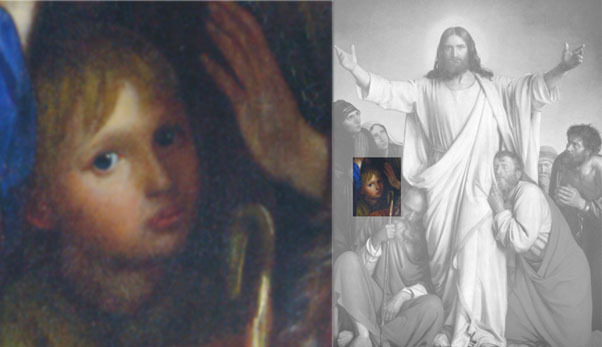 This time around, it’s a little more difficult to spot our staring child in the painting Christ and the Children. The most obvious child in the detail above is intently looking at Jesus, while a tiny half face and eye (rest hidden in a shadow) appears to be looking at your shoes. Perhaps, in this case, he’s simply waiting his turn to receive a blessing from Christ. Isn’t that life? We spend half of it waiting in lines. It’s pretty hard to miss the child in Christ and the Small Child. Our Lord embraces and emphasizes the olive-branch holding boy who appears to be looking at your right shoulder this time around (coffee stain on your shirt maybe?). Certainly the emphasis on the child is that you need to be simple like him to gain the kingdom of heaven. The olive branch, on the other hand, traditionally symbolizes Christ’s victory over death. 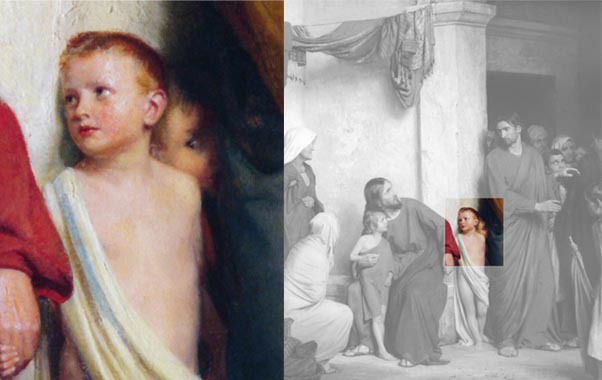 We almost missed this child while wading through Carl Bloch’s art, but there the hidden boy is (almost as hidden as the one in Christ and the Children). 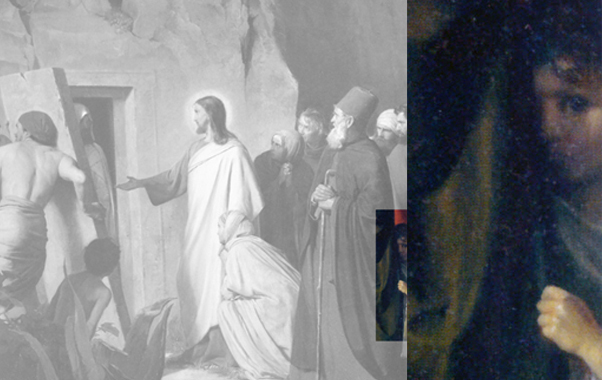 While Jesus Christ is Raising Lazarus from the Dead (see a shadowed Lazarus ambulating out of the tomb? ), we catch a glimpse once again of a shadowy face and single eye staring at your eye. It’s hard to tell, but the boy looks a little frightened this time. It’s not that surprising, considering the crowd has gathered at the local graveyard, which is probably not the place the boy usually goes to play. However, what’s possibly more terrifying (and incredible) is to hear and see Lazarus walking out of the tomb after you probably saw him cold and dead at the wake a few days previous. 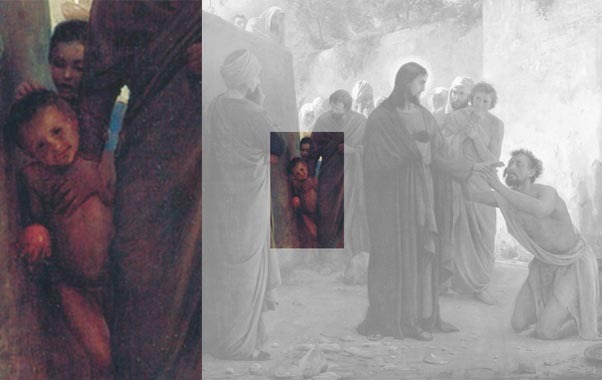 Once again, it’s very difficult to miss the child in the painting where Jesus is Found in the Temple. This time, though, he’s not looking at your shoes or eyes but at the Virgin Mary and St. Joseph. In this painting, Bloch wants us to focus and imagine the expressions of the two as they see their twelve-year-old son Jesus after searching Jerusalem for three days. Judging by the look on the boy’s face, he appears to be sad, surprised and empathetic after seeing their joy and tears—something we can use for our meditations on this mystery of the life of Christ. And, finally, one of our very favorites at Restored Traditions: The Sermon on the Mount. 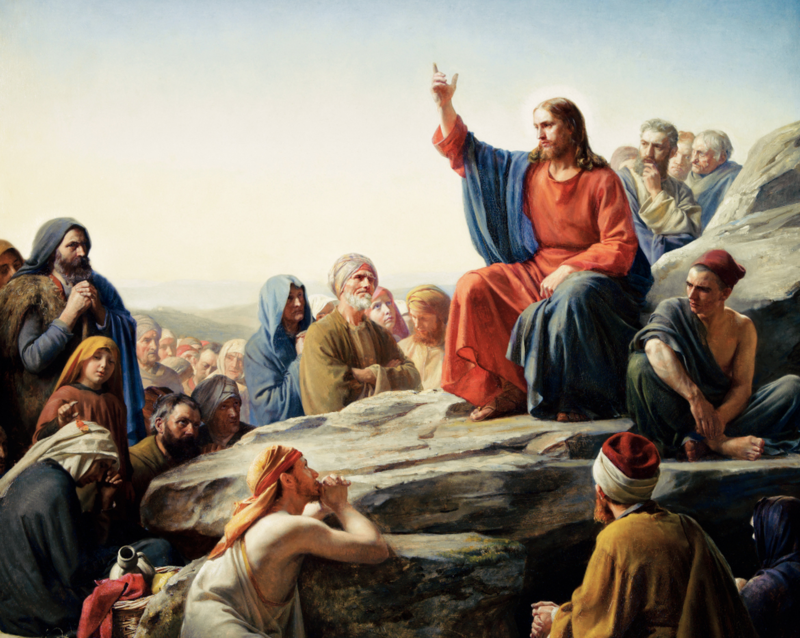 Christ preaches the summation of Christian doctrine in this painting, while we also get a handful of characters to look at. Each person in the painting has different emotions and dispositions for how they are receiving the word of God (probably would make another interesting blog post by itself). However, once again focusing on the child, we see him as the only young person in a world of adults. While not looking at the coffee stain on your right shoulder this time, our little guy is in the middle of a daunting task: trying to catch a butterfly! The boy is obviously missing the point of the sermon, but his dad (above) is devoutly soaking it all in with a gesture of fidelity (folded hands). This, in turn, teaches us the awesome responsibility father’s have to learn the word of God and transmit it to their children. Visit the Restored Traditions website.